Hartz is committed to supporting non-kill shelters and other community organizations that care for and protect pets until they find their forever homes. Through product donations, we are able to extend our support and make an impact on the health and well-being of companion animals while they are in the guardianship of foster families, sanctuaries and shelters. Establishing the Hartz Loving Paws™ shelter outreach program is a natural evolution of our dedication to animal rescue and rehabilitation groups, and embodies our Vision to help create a world where every pet leads a happy, healthy, long life with a devoted family. This year we aim to substantially exceed our donation support verse 2017, with the addition of our Help Us Help Them™ campaign exclusive to the United States. 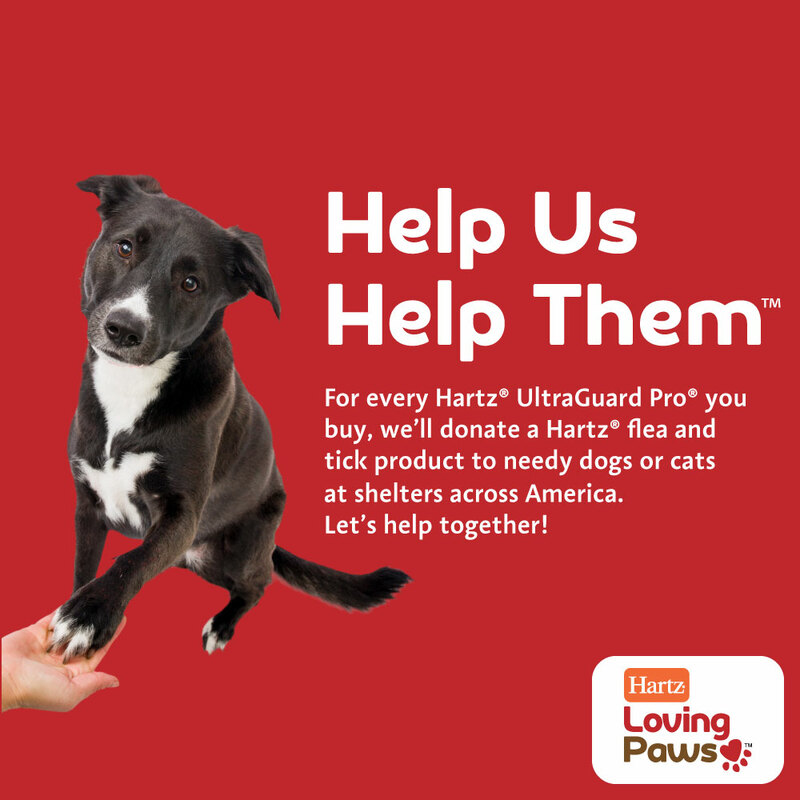 Our Help Us Help Them™ campaign will donate one Hartz® UltraGuard® flea and tick product for cats and dogs at shelters across the United States for every Hartz® UltraGuard Pro® topical drop product that is purchased from April 1, 2018 through May 31, 2018. With Hartz® UltraGuard Pro®, you are providing your pet with fast-acting, effective monthly protection against fleas at various life-stages as well as killing ticks. Utilizing Insect Growth Regulators, Hartz® UltraGuard Pro® topical products kill fleas, flea eggs and ticks† for preventive and treatment measures, while also inhibiting re-infestation. Now when you purchase a qualifying Hartz® UltraGuard Pro® product, you’ll get through flea and tick season without an itch, while also lending a paw to adoptable animals. Outside of food, treatment medications as well as preventatives (such as flea and tick control methods) are one of the top pet supplies needed by shelters to keep dogs and cats healthy and happy while in their care. In 2018 and beyond, Hartz looks forward to creating additional efforts that increase the quality of life for pets in need and making even more product donations in support of our Hartz Loving Paws™ program, providing shelter animals with the care essential for a new beginning.